Place an order for a hard copy of Creating Vibrant Communities. 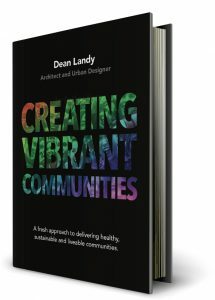 Creating Vibrant Communities is a new book by architect, urban designer and philanthropist, Dean Landy. Creating Vibrant Communities sets out to shift the current industry discourse from what outcomes should be achieved when creating new places, to how people involved in creating new places can work smarter and more collaboratively to achieve them. Creating Vibrant Communities goes beyond the rhetoric, to provide practical solutions for delivering communities that live up to the challenge of being healthy and vibrant and hence more socially, environmentally and economically sustainable.